"The best petting zoo and animals hands down! 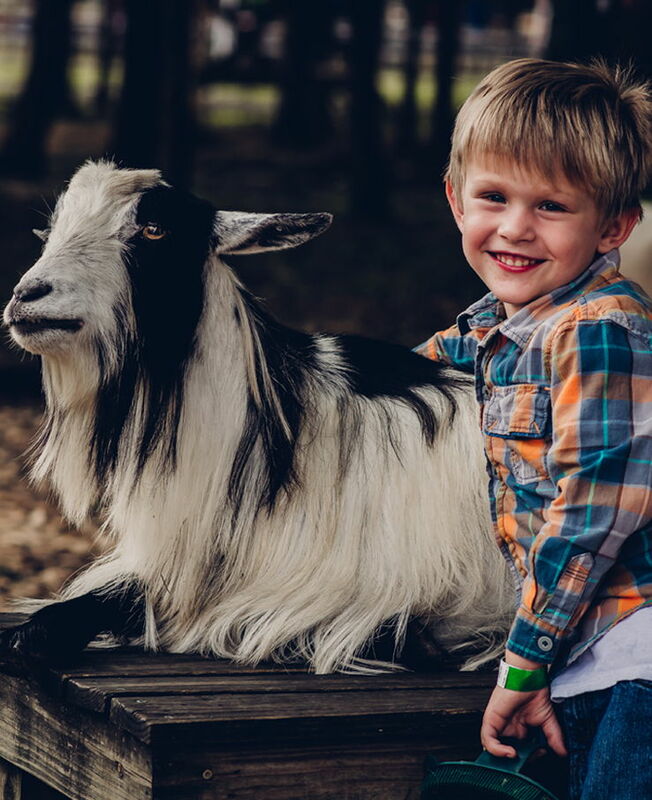 "Katie G.
Lucky Ladd Farms is home to the largest petting farm attraction of it's kind in Tennessee featuring hundreds of friendly farm animals and exotic livestock. You will learn about a variety of domesticated farm animals and enjoy unique live encounters. Our interactive approach is fun for young and young-of-heart alike! Get up-close and personal to pet, snap selfies, love and hug our sweet friends in Lucky's Barnyard. You'll see cows, goats, sheep, llamas, alpacas, chickens, turkey, pea-fowl and more! Guests can enhance their experience with the purchase of a animal feed snack bag for $1 and literally have the animals eating from the palm of your hand. Snack bags of feed available for $1.00. While the horses, donkeys and pigs love your gentle pets and attention too, we don't encourage guests to feed these friends as they sometimes bite little fingers. We also remind parents the importance of proper hand-washing to prevent the spread of germs after your farmyard visit with the animals. Hand-washing sinks are located at the attraction exit-ways and sanitizer can be found throughout the attraction. Let your little one enjoy this classic form of entertainment that children have loved for years. Over 20 miniature horses, donkeys and ponies are proud to call Lucky Ladd Farms their home; and they're eagerly waiting for your doting affection. So let's get saddled up for ride that's sure to be a highlight of your child's day! Children are safely led around a pony carousel in a fenced enclosure by a trained attendant. Parents may be asked to assist children depending on their size and abilities. Riders must be under 4' tall and weigh less than 75-lbs. Attraction operates on timed schedule.